A limit of Canada geese or Snows calls for a wild goose recipe that does justice to the dark, rich meat. Improperly cooked, it can be dry and tough, so a good recipe is a must. One of my favorite recipes starts with a soak in marinade, and ends with some time in the smoker. It's an easy recipe and makes for great eating. Clean up the breast halves. Check closely for shot...steel shot is hard stuff to be biting on. Slice the goose breasts into 1/2 inch thick strips, cutting lengthwise, and soak them in the marinade for eight hours. Fire up your smoker, or set up your grill for smoking . 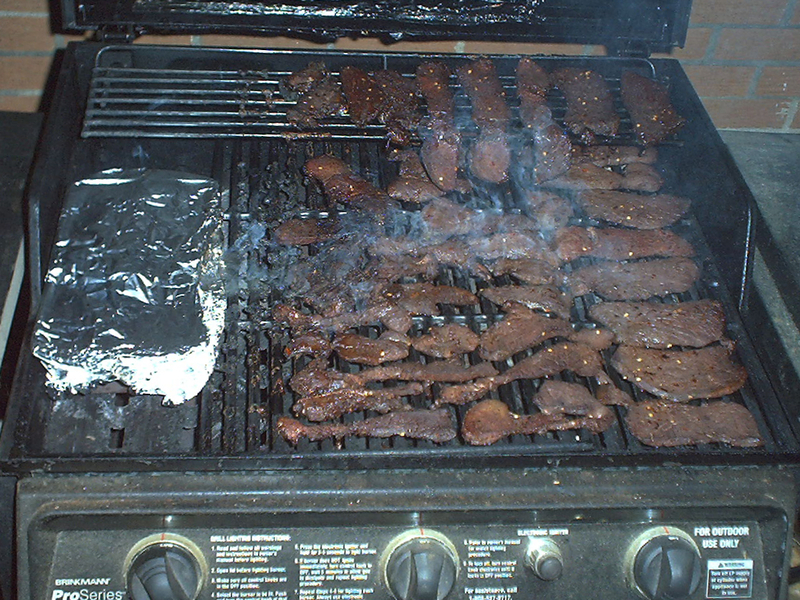 Use your favorite wood to smoke the strips...goose has a lot of flavor and can handle a heavy smoke. I like the heat, so before laying the strips in the smoker, I add a few sprinkles of red pepper flakes. That helps keep me warm while I'm waiting for the the honkers in my pop-up. Smoke the goose at 200˚-225˚ Fahrenheit for one to two hours, or until the internal temperature is 165˚F. Try not to let these smoke too long. They will start to dry out, and the sugar from the marinade can scorch. If you don't have a smoker or a grill, you can cook this wild goose recipe in the oven. Just stick a toothpick through one end of each strip, and hang them through the upper oven rack. Set the temperature to 225˚F, and they'll be done in about 1 and 1/2 hours. Lay foil on the lower rack to catch the drips. This wild goose recipe comes in handy here in the Central Flyway. I'm sure you'll enjoy it wherever you are, too!